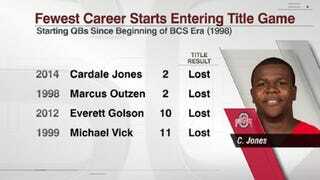 Cardale Jones was spectacular in leading Ohio State to wins in the Big Ten Championship Game and Sugar Bowl; however, his inexperience proved too much to overcome on the biggest stage. Jones is one of only four players with fewer than a dozen starts entering a national championship game. None emerged with a title. Whoops! Somebody better hit the "unpublish" button! Update: About five minutes after we posted—at least an hour after ESPN's story went up—they pulled it down. I've dropped a screenshot of it in the comments.